Over the past 20 years, there has been a major shift in how large public companies have compensated their outside Directors.1 These changes have included the elimination of Board meeting fees, granting of equity compensation in the form of full-value shares, the elimination of Director retirement plans and other perquisites, adoption of stock ownership guidelines for Directors, and giving of supplemental cash retainers to Committee Chairs in recognition of their substantial time commitments to committee work. 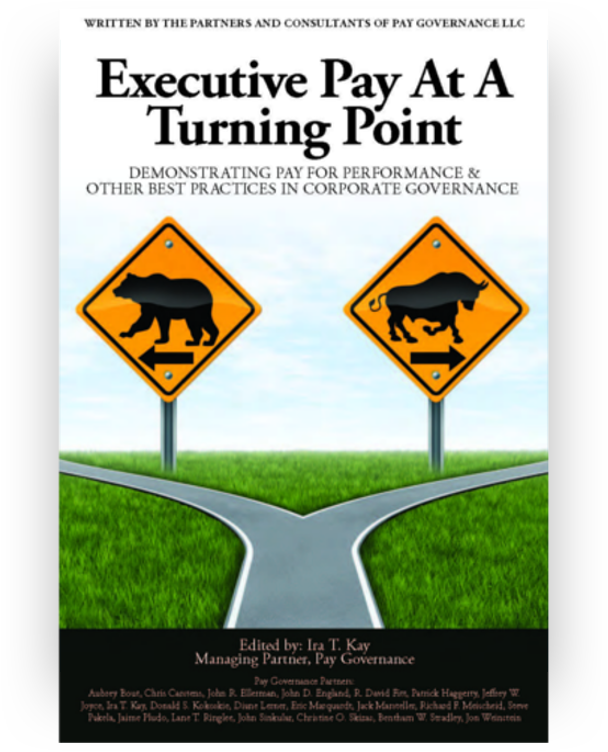 A recent Pay Governance review of Director compensation among S&P 500 companies reveals that these trends have become embedded in the policies and practices driving Director compensation in large U.S. companies.2 The survey, which reports 2016 Board compensation, shows that the median total direct compensation awarded to an S&P 500 corporate Director was $265,487. This represents a <1% (i.e., 0.5%) annual compensation increase for 2016 compared to 2015. In this Viewpoint, we examine each of the 5 policies/practices cited above and discuss our findings for FY2016 Board pay. (1.) Companies have mostly eliminated Board meeting fees – Over the course of the past 5 to 7 years, more and more companies have stopped paying meeting fees for regularly scheduled Board of Director meetings, and have instead increased annual cash retainers paid to Directors. Only 19% of S&P 500 companies report paying separate meeting fees for each Board meeting attended. The aforementioned S&P 500 survey reported the median annual cash retainer at $90,000 in 2016. Similar to the shift away from Board meeting fees and to service-based retainers, only 21% of S&P 500 companies provide meeting fees for attendance at Committee meetings, and instead compensate Directors through the Board retainer or supplemental Committee member retainers. 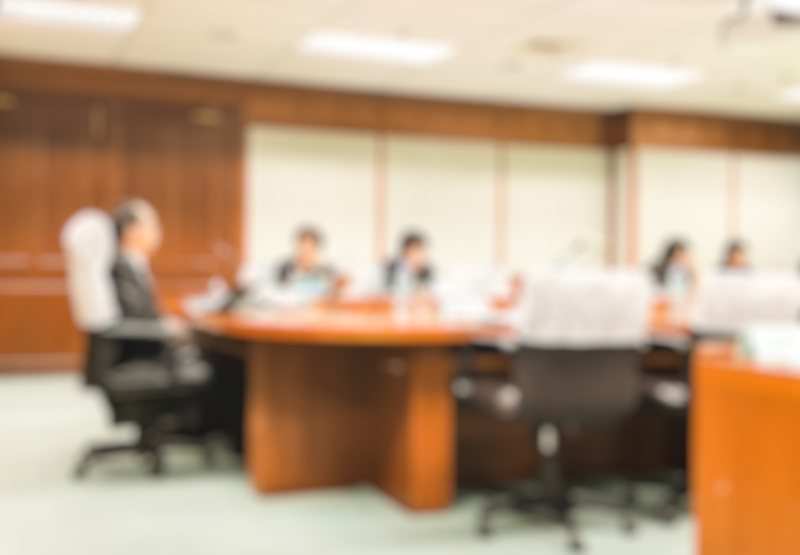 Some companies provide supplemental meeting fees for an abnormally high number of Board meetings in a particular year. We found that the median number of S&P 500 Board meetings is 7 per year; some companies provide a supplemental $2,000 fee for each meeting held in excess of 10 per calendar year, for example. (2.) Equity grants are in full-value shares – Full-value shares (in the form of stock grants, restricted stock, restricted stock units, or deferred stock units) are granted to 96% of S&P 500 company Directors annually. Only 12% of S&P 500 companies grant stock options to non-employee Directors, including some companies which grant stock options in concert with full-value shares. As with executive long-term incentive practices, stock options have lost favor, having failed to recover from the “black eye” attributed to egregious stock option practices in the early 2000’s. Our S&P 500 review found that the median value of annual grants to Directors was $150,000 in 2016, and that most companies use a fixed dollar approach as opposed to a fixed number of shares in determining the size of annual grants. Further, the mix of cash versus equity is now denominated in 41% cash and 59% equity value for the median S&P 500 Director. (3.) Director retirement plans and other perquisites have disappeared – In 1996, the National Association of Corporate Directors (NACD) released its Blue Ribbon Report on Director Professionalism. In that report, the NACD stated that (i) compensation tied to Director tenure, especially Director retirement plans, was inappropriate for compensating Directors and (ii) company programs for non-employee Directors should be composed solely of cash and equity. As a result, most public companies moved to drop their Director pension plans and other retirement plans within the ensuing 3 years. Today, many companies allow their Directors to voluntarily defer their annual equity grants or equity equivalent grants into some form of non-qualified deferred compensation plan. Such compensation is usually deferred until the Director’s service on the Board terminates and may be paid in either a lump sum or a series of payments. It should be noted that some companies have recently required a portion of the annual equity grant to be deferred. (4.) Directors are subject to stock ownership guidelines – Institutional investors and their advisory firms deem executive ownership of a meaningful amount of company stock to be an important consideration and in all shareholders’ best interests. This same tenet holds true for non-employee Directors. Now, 89% of S&P 500 companies have adopted stock ownership guidelines for corporate Directors. The median stock ownership guideline requires Directors to acquire and hold company shares equal to 5 times the annual cash retainer within the first 5 years of Board service. (5.) 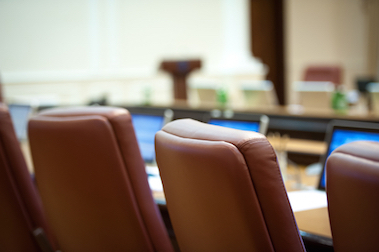 Supplemental cash retainers are paid to Committee Chairs – Much of a Board’s work is performed at the committee level. Certain committees, especially the Audit and Compensation Committees, follow rigorous schedules to uphold their governance responsibilities in these key areas of corporate oversight. Committee Chairs are subject to substantial time commitments and extra duties with respect to their committee service and are usually paid supplemental cash retainers. We found that S&P 500 median Committee Chair retainers were Audit Committee Chair at $20,000, Compensation Committee Chair at $20,000, and Governance Committee Chair at $15,000. Today, Director compensation programs look quite similar from company to company. The primary difference between programs is the level of compensation (typically correlated to company size and/or industry sector), not the form of compensation. 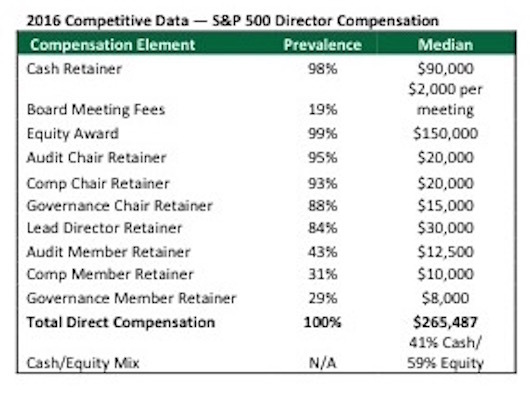 Even Director compensation levels for S&P 500 directors are significantly more compressed than they have been historically. The range of director total compensation between the 25th percentile, median and 75th percentile are now 11% and 13% of median, respectively. As corporate governance norms have evolved, the preferred model for compensating Directors has become almost universal. Is this homogeneity in Director compensation program design going to continue into the foreseeable future? We do not expect drastic change in the form of Director programs for the next several years, although we do anticipate market increases annually in the amounts of Director compensation. 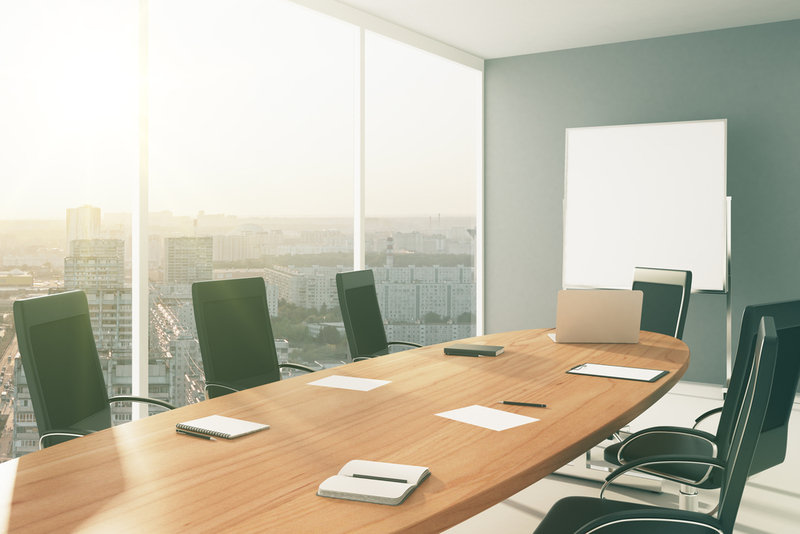 The attraction and retention of skilled and qualified Directors is of paramount importance to U.S. companies, their shareholders, and the execution of effective corporate governance principles. The current approach to compensating Directors principally in cash and equity is well aligned with shareholder interests and companies’ need to compensate Directors fairly and equitably. 1. Diane Lerner. 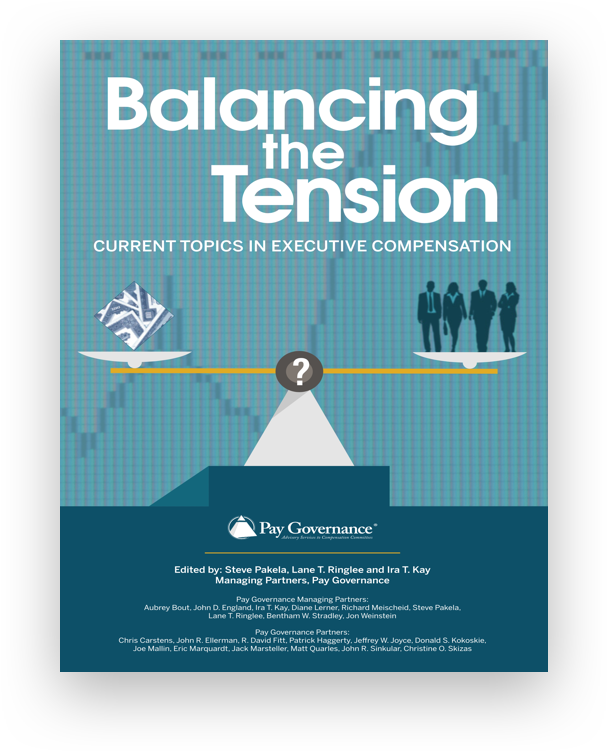 “Board of Director Compensation: Past, Present and Future.” Pay Governance LLC Viewpoint. 2016. 2. Sample reflects most recently available fiscal year data, generally FY2016. Data provided using Main Data Group.